When the Los Angeles police showed up at the large house at 858 North Andrews Boulevard on the hot summer night of August 22, 1922, answering a neighbor’s call of hearing gunshots and a woman’s frantic cries, they found the man of the house, rich businessman Fred Oesterreich, lying on the floor, dead. Locked in a closet from the outside was his younger wife, Dolly Oesterreich, telling of a strange man who broke into the house to rob them. With only the husband’s watch missing, something about the crime didn’t seem right to the police, but on the surface they accepted the story of a burglary gone wrong. 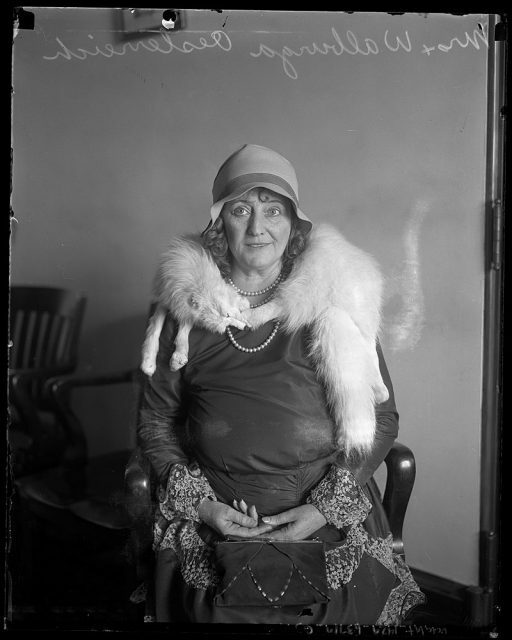 Portrait of Walburga Oesterreich, circa 1930. Just how “not right” the situation was at North Andrews Boulevard, few people could have ever imagined in the 1920s when the details of the love triangle came to light, and it has the power to shock even today. It is a darkly fascinating tale of thwarted needs and sexual obsession. Dolly is a woman who can exert control over not only her husband Fred, but a hidden lover, Otto Sanhuber, and the lawyer who comes along later. Just who was the real Dolly, the woman dubbed a “naughty vamp” during the lurid murder trial that dominated headlines of the day? Born in Germany in 1880, Walburga “Dolly” Korschel immigrated to America but found life pretty grim on a farm — until, when she was in her early 20s, she married the wealthy Fred Oesterreich, owner of a Milwaukee apron factory. After a while, married life seems to have been less than scintillating for housewife Dolly, with reports her husband drank a lot and didn’t thrill her in the bedroom. But all of that changed the day that a 17-year-old employee of the apron factory named Otto came to the Oesterreichs’ house to fix her broken sewing machine. The stories conflict a little on this point, but supposedly Dolly had already spotted teenage Otto at the factory and knew he was on his way over — so she met him at the door in a silk robe, stockings, and perfume. This is when the situation shifted from a run-of-the-mill extramarital affair to something bizarre. Dolly moved Otto into the attic of her home, where he lived in secret, quitting his job and cutting himself off from everyone else, for five years. When he had to hide in the attic, Fred wrote pulp fiction, pursuing his dream of author glory. Not too surprisingly, Fred and Dolly’s marriage deteriorated; their fights got louder. That’s why, on the night of August 22, 1922, when Fred was most likely drunk and shouting angrily at Dolly, a young man suddenly appeared in the doorway of the room. Otto had come downstairs from the attic, and he shot Fred with a .22 caliber gun. After the murder Otto actually fled California and Dolly found new lovers, including lawyer Harold Shapiro. However, still obsessed with her, Otto returned to Dolly, and to a hidden existence. Mrs. Walburga Oesterreich being arraigned in court on the alleged charges of murdering her husband. 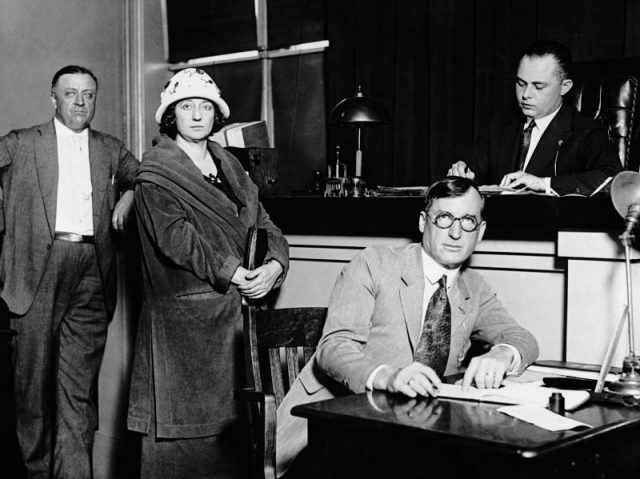 Left to right: Detective Cline, Mrs. Oesterreich, Judge Channing Follette, and a court reporter. 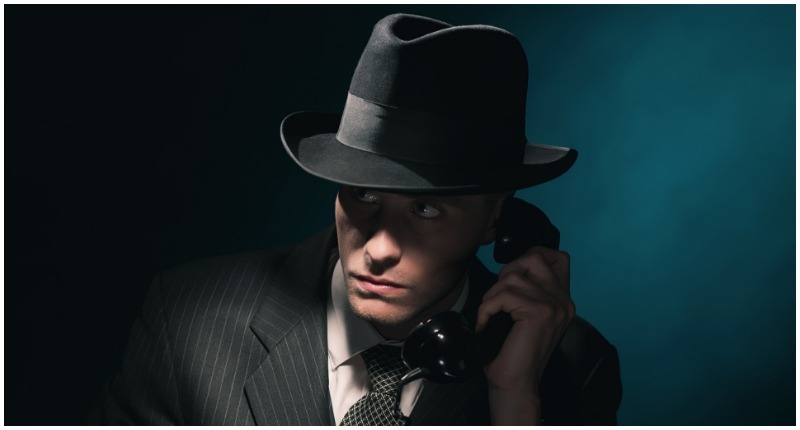 The suspicious police did get a break, and on July 12, 1923, Dolly Oesterreich was arrested. Cops thought they’d found the murder weapon in the La Brea tar pits. Unfortunately, it couldn’t be matched to the crime. Dolly was freed, but before she left jail, she told Shapiro about Otto, begging him to get some groceries for her hidden lover, and to tap on the ceiling, which was the signal it was safe to come out. When Shapiro and Dolly broke up some years later, he told the police about Otto, and her secret lover was arrested and put on trial. Ecstatic reporters named him “Attic Man” and “Bat Boy.” His defense was he was enslaved by Dolly, which didn’t fly. The jury found him guilty of manslaughter. However, the statute of limitations had run out on Fred’s murder, and Otto was free. Dolly’s trial ended in a hung jury, and she too walked out of court. This is when Dolly and Otto finally broke up for good. She stuck with her next boyfriend for 30 years, marrying him two weeks before she died at age 75. As for Otto, no one is sure what became of him, only that he never did find fame as a writer of pulp fiction.